As promised, today I am going to share with you the recipes I used to create my gingerbread house. Click here to read Part 1. I’ll start with the icing. You have to use an icing that dries very hard when you work with gingerbread or else the whole thing will fall apart by the time you put the roof on. I have a standard royal icing recipe that I use for cookie and cake decorating so I had been using that over the years for my gingerbread as well. It always seemed like it never totally adhered to the gingerbread, though. It would seem fine at first, but as the days went on it would slowly detach itself. I tried adding more water to it, thinking I was just making it too dry to start with, but that didn’t help either. Finally, this year I got the nerve up to call one of my competitors and ask her if she would be willing to share her icing recipe since she never seems to have this problem. To my joy, she was extremely nice and completely willing to share her recipe. It is a recipe from the well-known cookbook, The Joy of Cooking . It is called Royal Icing Glaze in the cookbook. This turned out to be a fabulous icing and I will never a use another when it comes to gingerbread construction. I haven’t had one piece fall from my house this year. I used the recipe and then added a few instructions to it from what I know about making royal icing. 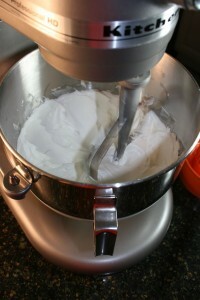 Here is a tutorial and recipe for making the icing. 1. Sift the confectioners’ sugar. 2. Beat the egg whites until stiff but not dry. You still want them to glisten. 3. Gradually add sifted sugar and lemon juice, alternating a little at a time, until completely mixed. 5. Mix at a speed 2 or 3 (on a tabletop mixer) for about 7 minutes. 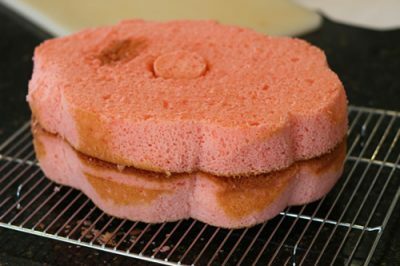 This will incorporate air into your icing and you will see it get puffier. You can see the icing get fluffier as air is incorporated into it. 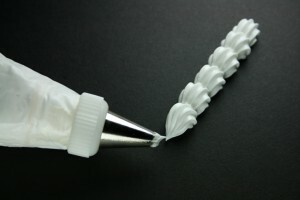 When it is done it should easily squeeze through your decorating tip but be stiff enough to hold its shape. 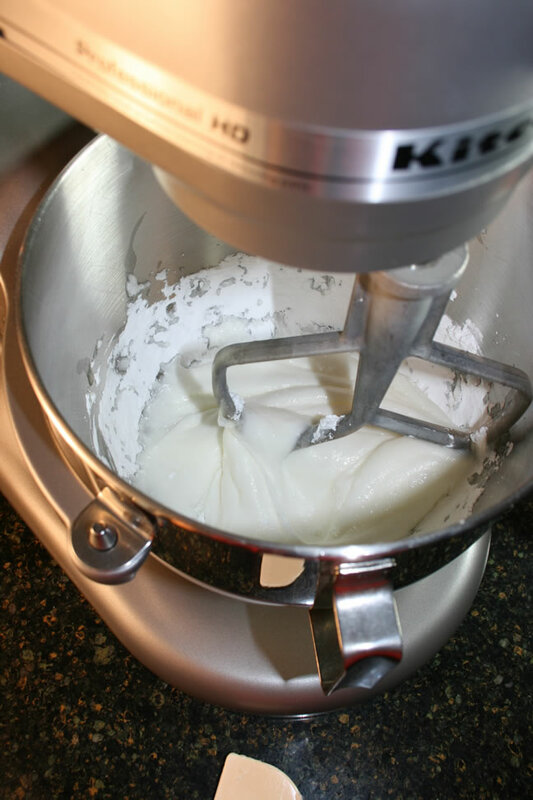 If you want to make the icing stiffer, add more sugar. If you want to make it softer, add more juice or egg white until desired consistency. You will need to always keep this icing sealed in an airtight container or covered with a damp cloth when you’re not using it as it will dry out on you really fast. I usually also keep a damp washcloth or paper towel next to me while I am decorating so that I can wrap it over the decorating tip, when I am not using it, to keep the icing from drying inside the tip. This icing is best used right away but if it sits for a long time and starts to go flat, re-mix it for another 7 minutes before using again. If it sits for more than a day or so I usually start with a fresh batch. For this reason, I only make a batch at a time, even though I may use several batches to complete a house. Next is the gingerbread. I have tried a different gingerbread recipe almost every year. I never seem to be completely happy with them and always vow that “next year I will find the perfect recipe.” Well, this year I think I finally did! Let me mention, though, that this recipe I came up with may not work in all parts of the country. I live in a very arid climate and at a high altitude, so I often have to add more liquid to recipes. I ended using a recipe and adding more liquid to it to work for my environment. The original recipe can be found here. 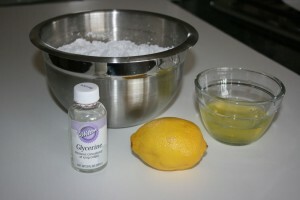 If you live in a more humid area you may want to try this recipe first. Also, keep in mind that this is construction gingerbread and not gingerbread for eating. This gingerbread gets very hard and is not what you would want to use for making gingerbread man cookies to eat. 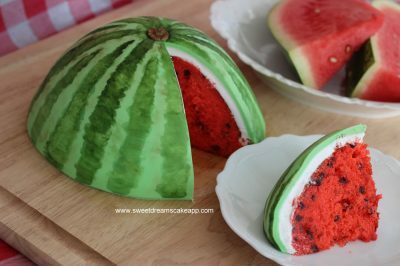 Here is my tutorial and recipe for making my version. 2. Sift together flour, cinnamon, ginger and salt in a large bowl. Set aside. 3. Whip shortening and sugar until light and fluffy. 4. Add light corn syrup and molasses to sugar mixture, slowly, until thoroughly mixed. If you want colored dough you can add food coloring at this step. 5. Add warm water and mix. 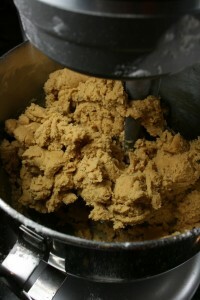 Before dry ingredients are added. 6. 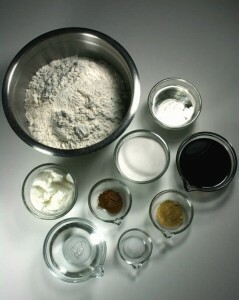 Add dry ingredients a little at a time until all is mixed in. After dry ingredients are mixed in. 7. 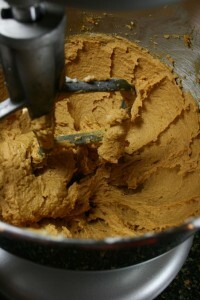 Remove dough from bowl and knead by hand for a couple of minutes. 8. Flatten into a rectangular disk. 9. 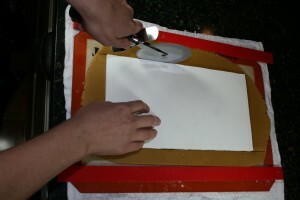 Divide the disk in half with a knife or pizza roller and place each half in a Ziploc bag to rest for 1 hour. Although it is best when used the same day, the dough will keep for a week at room temperature or a month in the refrigerator. 10. Roll dough evenly onto a Silpat or piece of parchment paper, using a small amount of flour to keep rolling pin from sticking to dough. You want your support walls at least ¼” thick. Non support pieces can be 1/8” thick or so. I use cookie slats (also called Perfection Strips) to make sure I have the same thickness over the entire piece of dough. I use the red ones for support walls and the white ones for non-support pieces. You can also use slats of wood from the lumber store or rulers, if they are the right thickness. A damp dish towel keeps my Silpat from sliding around. 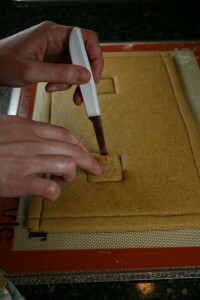 The cookie slats help me roll the dough to an even thickness and I use a pizza cutter to cut around the pattern. 11. Cut around pattern, leaving about ½” scraps around the walls to hold the dough’s shape while baking. 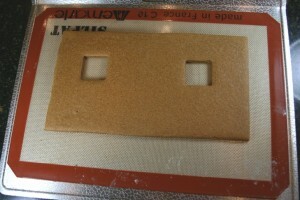 Leave about 1/2 inch excess around the wall to retain its shape while baking. 12. Cut windows, doors, etc. 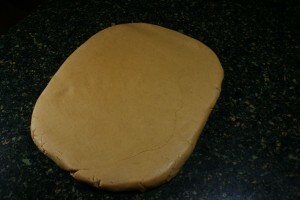 but leave them in place for first phase of baking to help the dough retain its shape. 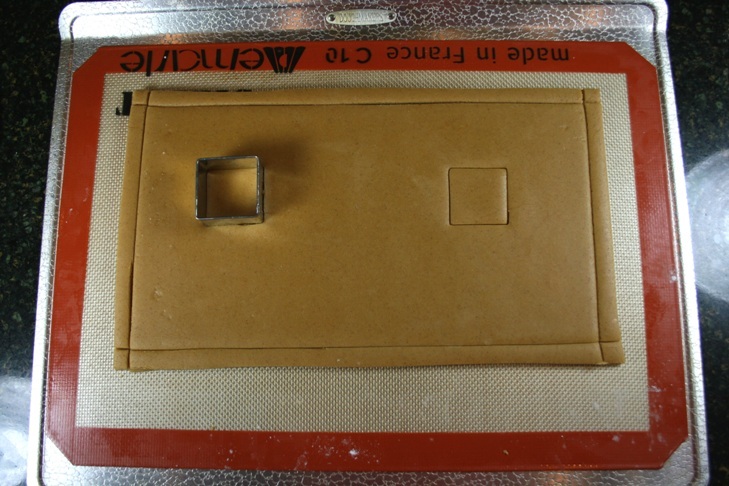 I like to use square cookie cutters as an easy way to cut out windows and doors. You can also use a small knife to do this. Leave door and window cutouts in place during first phase of baking. 13. Bake for 18 minutes then remove from the oven and re-cut around walls and windows, doors, etc. Remove scrap pieces and use a small knife to remove windows, doors and other small pieces. If any air bubbles have risen in the dough use a tooth pick or pin to pop a small hole in them and flatten with your finger. 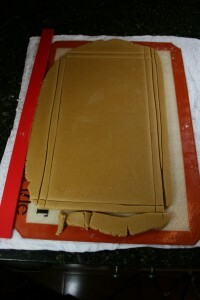 Remove all cutouts and scrap pieces around the sides before the final bake phase. 14. Return to oven for about another 10 minutes. This is an estimate; baking time can vary greatly, depending on the size and thickness of pieces. Check often. Walls should be golden brown. It is actually better to overcook your pieces slightly than to under cook them. 15. Remove from oven and let cool on a flat cooling rack. Do not move until completely cooled. The amount of dough you need will vary depending on the size of house you are making. It should be enough for a small house. Because I usually do larger houses, I end up using several batches. Next time, I will teach you the basics on how to plan and construct a gingerbread house then show you some of the things I did to make my house unique. Until next time, God bless and Sweet Dreams! 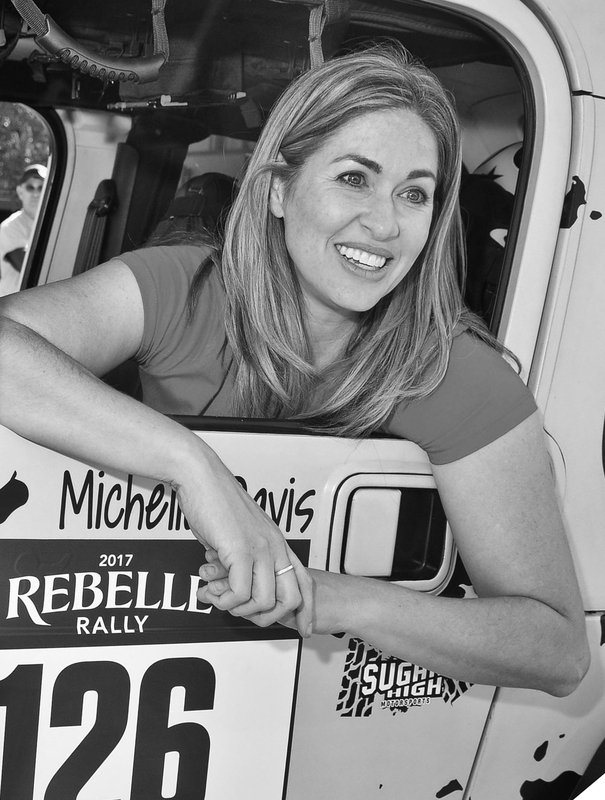 Michelle, this is awesome, and is making me think I could actually try this…which is probably stupid on my part. You are amazing! Amy, you can definitely do it! Sometimes just having the little tips about things makes all the difference. 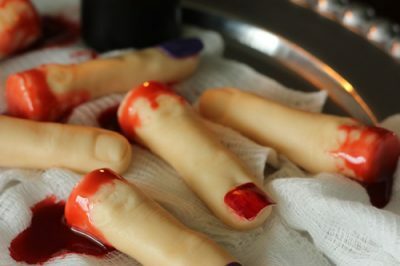 I hope that my tutorials will take the intimidation factor out of decorating and make people feel like they can do it. I realize no one is making gingerbread houses right now but I decided to do this while it was all fresh in my mind and they can come back to it as reference next holiday season. Thank you for the input! This information is so helpful. I am going to print this out and save it for next Christmas. Thanks for your expertise! No need to print it out and save it, Michelle will be doing a full new Gingerbread series when the holidays come back around at the end of the year! Hi Lisa, I just saw your post. Thanks. All this info will remain in the archives so you can easily search for it again at the end of the year. Like Kevin said, I will post new gingerbread info around that time as well but probably won’t repost these basic instructions, just refer back to them in my new posts. Have you ever used Isomalt to glue the walls together? If so, do you use the new isomalt gun and sticks? I don’t like the way that the royal looks when it joins the walls. I heard someone (on tv) uses isomalt. YOUR royal looks great, but mine will not. I just know it. I haven’t but I am anxious to try that. I have heard great things about using Isomalt for construction. Plus I love that it is clear. I am planning on trying it with the next house I make. Unfortunately I don’t think I am going to be able to fit in a gingerbread house this year, though, so it may be another year before I know more. Be sure to let me know how it works for you if you try it.